Shoulder joint replacement is not as common as knee or hip replacement, but it can be successful in relieving joint pain. As difficult as this may be to believe, shoulder replacement surgery was first performed in the United States back in the 1950s for the treatment of shoulder fractures. As time passed, shoulder joint replacement has been used to treat conditions such as arthritis. Every year in the United States, a little more than 50,000 people have shoulder replacement surgery, According to Healthcare Research and Quality. Compared to the nearly 1 million people who undergo knee and hip replacement each year, it is clear that shoulder replacement is not very common. If nonsurgical methods such as changes in activities and medications do not help in relieving pain, your doctor may recommend shoulder joint replacement surgery. Joint replacement surgery is a safe and effective surgical procedure that can both relieve the pain you are experiencing and help you resume daily activities. No matter whether you have just begun exploring your different treatment options or have already decided to pursue it, this article is intended to help you understand this procedure more fully. As far as shoulder replacement surgery is concerned, it involves removing damaged parts of the shoulder and replacing it with artificial components, called a prosthesis. Most times, there are two options. One where just the head of the humerus bone (ball) is replaced, and another where both the ball and socket (glenoid) are replaced. 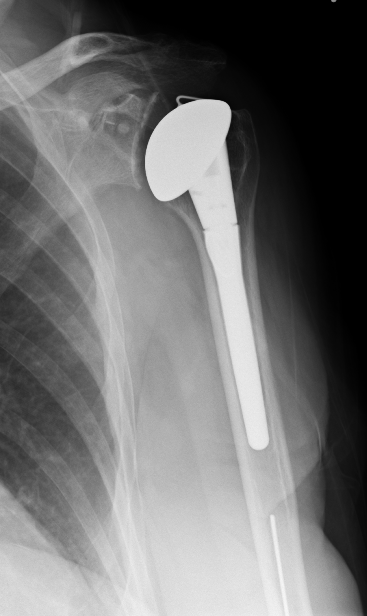 In most standard shoulder replacement surgeries, the arthritic joint surfaces are replaced with a highly polished metal ball that is attached to a stem, as well as a plastic socket. The components used in shoulder replacement surgery come in a variety of sizes. They are either “press fit” or cemented into the bone. If the bone is in good shape, your surgeron may opt for a press fit humeral component. If the bone is soft, the humeral component may be secured by way of cement. In almost all cases, and all-plastic glenoid (socket) component is secured with cement. Patients who suffer from bone-on-bone osteoarthritis and intact rotator cuff tendons are usually great candidates for a conventional total shoulder replacement. You will be advised to wear loose-fitting clothes and a buttoned shirt when you go to the hospital or surgery center for your surgery. Once your surgery has been completed, you will be using a sling and will have limited use of your arm. Most often, you will be admitted to the hospital on the day of your surgery. Once you have been admitted, you will be taken to the preoperative area and will meet a doctor from the anesthesia department. A discussion between you, your anesthesiologist, and your doctor will take place in order to determine the best anesthesia option for you. Patients are typically given either a general anesthetic, where you are asleep for the entire operation, or a regional anesthetic that only numbs the area near where the surgery will take place. On occasion, a combination of the two will be used. In total, a shoulder replacement surgery takes somewhere in the neighborhood of one to two hours. Once the surgery has been completed, you will be transported to a recovery room where you will remain until you full recover from the anesthesia that was administered. Once you wake up, you will then be taken to your hospital room. Once you have fully recovered from your operation, you should be able to lift your arm above shoulder height and bend your elbow such that you can reach the top of your head or into a cupboard. Shoulder replacement has been heralded for its ability to relive pain, resulting in incredibly high levels of patient satisfaction.